Make those hours spent toiling in the kitchen more comfortable with Grohes latest Sink Mixer Tap. 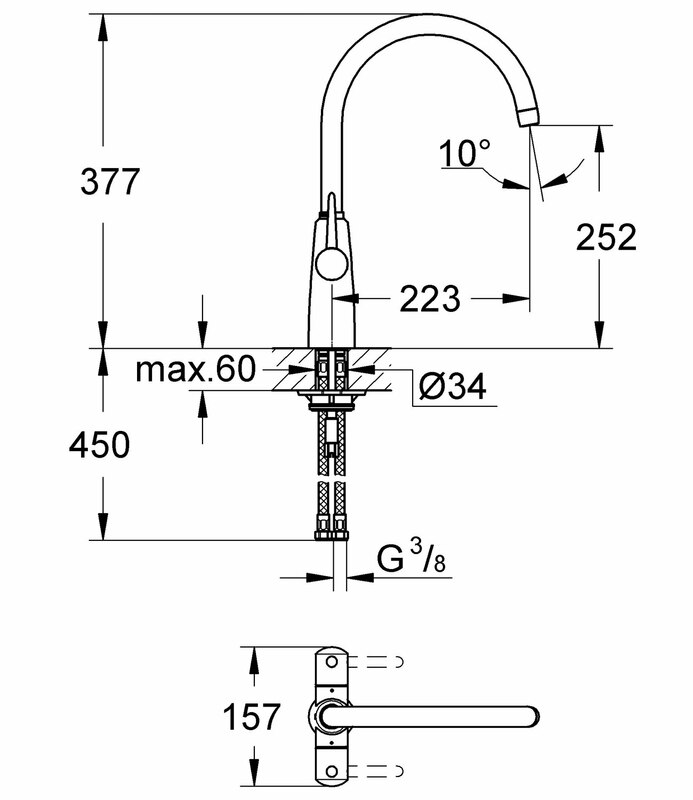 The product, a part of the Grohe Ambi range, features a tubular spout with a selectable swivel area of 0°, 150° and 360°. Easy to install, it has been crafted from fine quality material and has no back splash. The model, radiant in durable chrome finish, enjoys five years warranty against all manufacturing defects. These taps are class and so glad we had them along with the sink from QS Supplies. Very well made and simple to fit but please note when ordering you need to also order Flexible Tap Adaptors 15mm x 3/8" because Grohe have euro fittings. Not an issue as just a couple of extensions but you will be disappointed if you do not order with taps as you will not be able to fit to normal UK fittings. 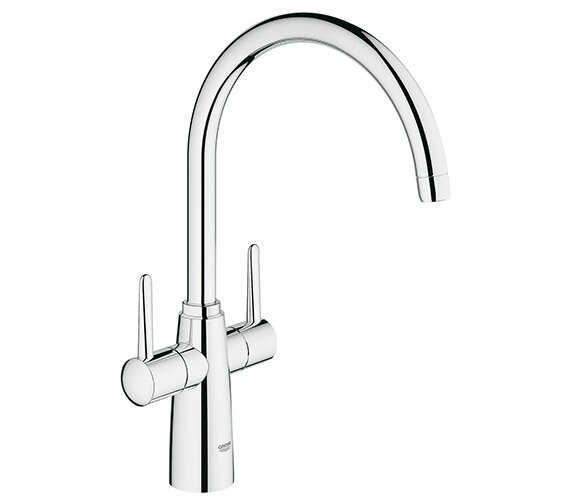 QS offered the best price on the web so all in all very pleased and would recommend both the taps and the supplier. 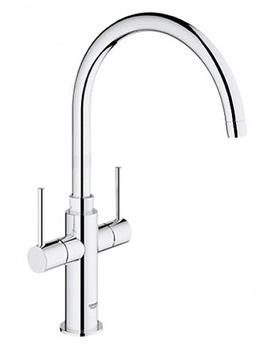 Found the tap I wanted for the best price, once ordered I was kept upto date with order progress. Ordered Sunday night arrived Tuesday morning.will definitely be first port of call for my next tap order. 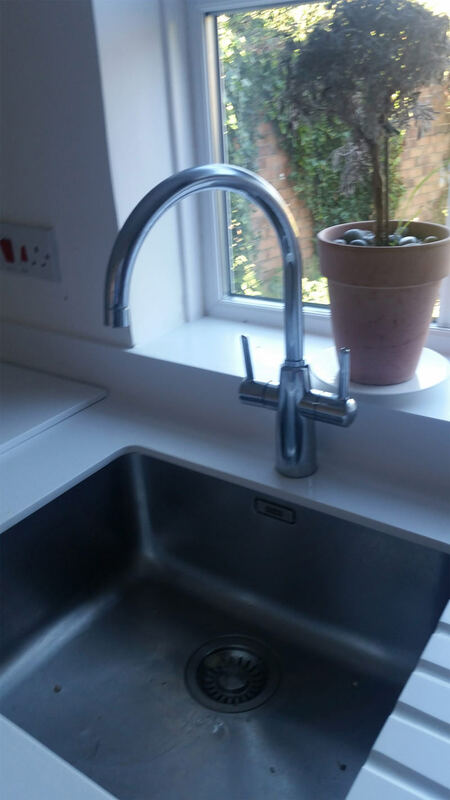 The quality is easy to see and feel with the tap, as previously mentioned in a previous review the handles do not line up but that review had been answered with a easy fix solution. Initially we were concern about the two taps, but after using it it came clear it was the perfect choice. Taps can be turned with one finger, very useful if you have your hands oily or dirty. The look is great and the curvy shape leaves lots of space under to wash stuff, also we like the rotation function. Overall very satisfied. My wife wanted to replace a tap supplied with our kitchen some years ago. We both surveyed options online, and this was a stand out obvious choice ..... 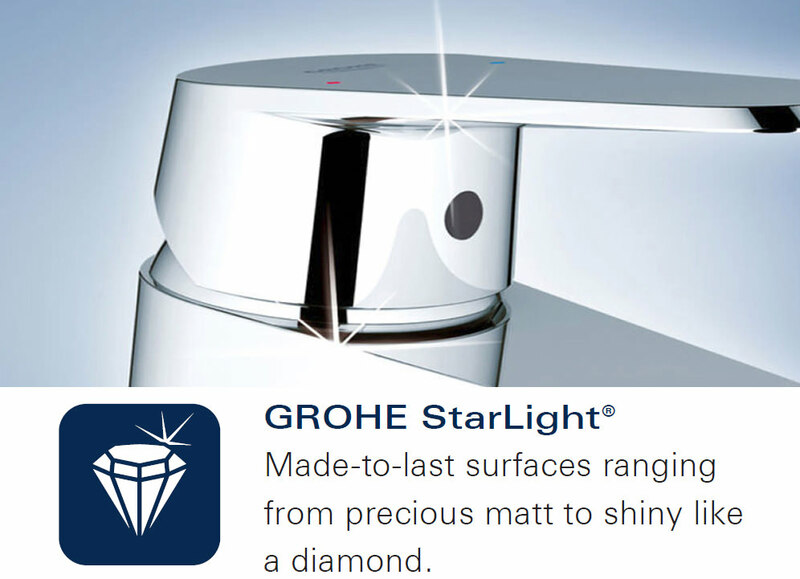 But would the item live up to Grohe spec and be in good order? Yes and yes. Happy with lots of brownie points from the other half and the satisfaction of using a quality product. From order to delivery this was a seamless task. My first time to use QS supplies and it won't be my last. I checked a number of websites and found exactly what I was looking for here. The service, delivery, value for money and quality of product was excellent and I would highly recommend this site for any future requirements. I searched for a long time to find the perfect low pressure mixer tap for my new kitchen. It was an excellent choice. Sleek looks, smooth lever action and a lovely steady but forceful flow. On top of that QSupplies offered the cheapest price by far and excellent customer service. I love it! Excellent taps from Grohe, I must admit I'd been sceptical of Grohe in the past thinking a shower from them we have (to be fair does what it should) did not feel as substantial as Aqualisa showers we have. These taps have been in for a month or two now and we really like them. This was ordered using the internet and arrived a day or two later. In itself the product is fine. The only problem is that the water pressure could be higher - our plumber says that this is due to the nature of a mixer unit, though its predecessor worked well. Ordered from QS as recommended the cheapest offer available anywhere. It came very quickly efficiently packed. Have had it installed - not only is it much easier to use than my previous taps but it looks good too . Would definitely use QS again. Hi does this tap need a conversion kit to attach to pipework? The tap tails are 3/8" so you will need a 3/8" x 15mm reducer if connecting to 15mm copper pipe. 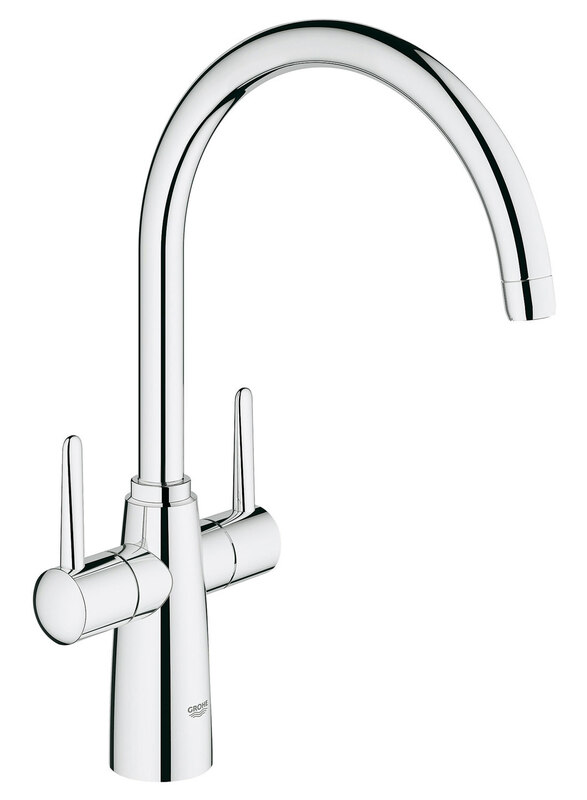 "Manufacturing code : 46914000"
is the Ambi Contemporary 2 handle kitchen sink mixer tap with swivel spout (QW-V28544) a single flow tap. The 30189000 should be a suitable replacement as the dimensions are similar. The base on the 30189 is 52mm so would cover any existing holes and it will work from 0.4 bar. The dimensions of the 30189000 as all bigger so this should be a suitable replacement (the base of the 30189 is 52mm). The only thing you need to check is that the hole in the worktop is 34mm to allow for the flexi pipes to pass through. Hi Please can you tell me if this has an areator on it and if this is what the no back splash means? The Ambi 30189000 has a flow straightener as it is designed for low pressure water systems. 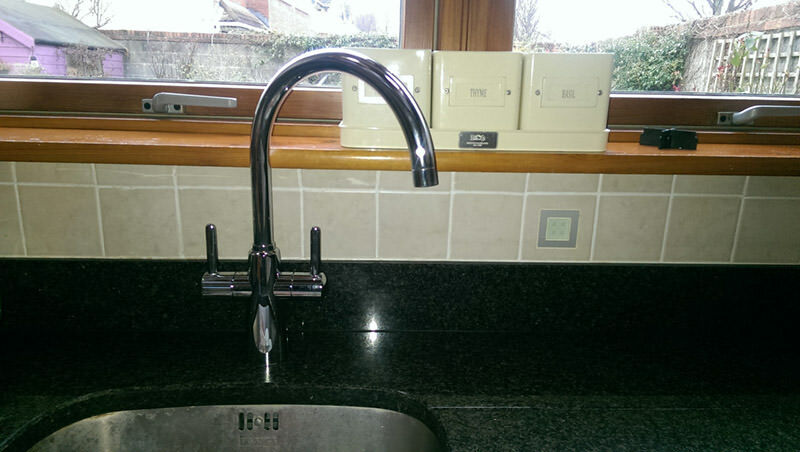 Emma Hallums asked below whether the handles can be adjusted as we ordered 2 of these taps from you and neither unit have handles which line up. You answered that the 'handles can be pulled off to easily adjust them', only how? The technical PDF makes no mention of how to get the handles off and there are no grub screws to loosen. Neither the plumber, the heating engineer nor our kitchen fitter have been able to figure out how to get the handles off. Please help!! Thank you. Sorry for the inconvenience and misunderstanding due to the answered questions. This tap features twin lever handles, which opens to the front. There is no adjustment and alignment.